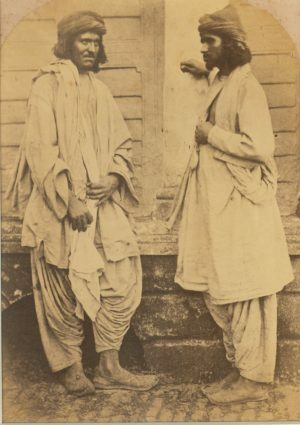 Afghan Group. Kabool (Kabul). c1868. Part of THE PEOPLE OF INDIA by J. Forbes Watson & John William Kaye published in 1868. With original letterpress description. Condition: Fair contrast and tonality. Size: 6.5 x 4.5 inches. Shipping: $20 U.S. $30 Worldwide. Materials: Albumen photograph in archival mat.